Guinness Nigeria Plc, a subsidiary of Diageo Plc, has reiterated that meeting the needs and expectations of its customers and stakeholders will remain a major imperative in the coming years. 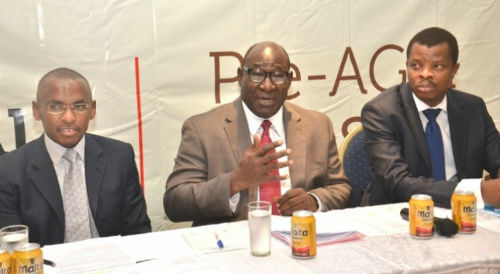 Managing Director/Chief Executive Officer, Mr. Peter Ndegwa, speaking at the company’s pre-annual general meeting press briefing in Lagos, stated that the future holds great promise for all stakeholders as the company continues to grow the business on the back of quality, innovation and technology. “Our long-term sustainability is dependent on the consistent provision of quality products that do not only meet customers’ expectations but also create impressive returns to all stakeholders, be they shareholders, employees, trade partners, and suppliers. We are resolutely committed to these goals,” Ndegwa stated. Describing the operating environment as challenging due to declining oil prices, tighter monetary policy measures, inflation, and pre-election slowdown in economic activities, Ndegwa said the company nonetheless posted an impressive performance in its full year results for the period ended 30th June 2015. Ndegwa stated, “We delivered a 9% increase in net sales during the year in a tough trading environment largely driven by the growth in our Ready-To-Drink category and value beer segment. Our gross profit also grew by 9%. During the year, we continued to invest significantly behind our brands and our route to consumer expansion”. The overall results reflect strong volume growth on the back of year-on-year impressive performance of its innovation and value brands. Mr. Ndegwa also reiterated the Company’s commitment to improving the percentage of Local Raw Materials used in its production. “In service of our focus to drive out cost in order to invest in growth, we have increased the proportion of our locally sourced raw materials from 27% to 43% and our intent is to continue to increase our LRM by empowering local suppliers – including farmers, SMEs supplying other inputs that can be locally sourced and other manufacturers or suppliers of other items by giving them secure contracts that can help them attract funding”, he noted. The Board of Directors of the Company also recommended, subject to approval at the Annual General Meeting slated for 26thNovember 2015 in Abuja, a dividend of approximately N4.82 billion, translating to 320 kobo per 50 kobo ordinary share. The dividend recommended, if approved at the Annual General Meeting will be paid to shareholders on 27th November 2015. Among resolutions slated for shareholders’ endorsement at the meeting include the re-election and confirmation of directors, approval of a dividend and election of members of the Audit Committee of the Company, appointment of PricewaterhouseCoopers as the new auditors of the Company and remuneration of Directors. He said the Company’s conformity to the highest standards of quality have enabled the repeated re-certification of its products and procedures by some of the world’s leading certification organizations as the International Standards Organization (ISO) as well as the National Agency for Food and Drugs Administration and Control (NAFDAC) and the Standards Organization of Nigeria (SON). The Company received the ISO 9002:1994 quality standard in 2001 becoming the first brewery in West Africa to be so honoured.